Help Restore Native Salt Marsh! I often travel to Elkhorn Slough National Estuarine Research Reserve near Moss Landing, CA (map) to maintain experimental plots, or collect cuttings and seed – see the Salt Marsh Restoration page for more details on my ongoing research at Whistlestop Lagoon. I can always use help with this fieldwork – no experience is necessary, so if you are interested please get in touch! 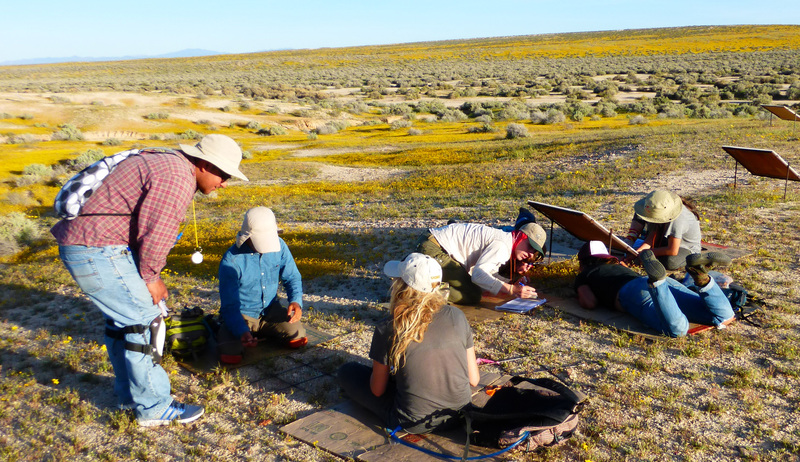 We assess survival of transplants in restoration plots at the lagoon, take growth measurements, track herbivory, and conduct percent cover surveys – so there are opportunities to gain experience with a variety of field methods. If you’re coming to the Slough bring a brimmed hat, sunblock, water, snacks, a warm jacket, and rubber boots if you have them. All volunteers must also print and fill out a Volunteer Waiver form. 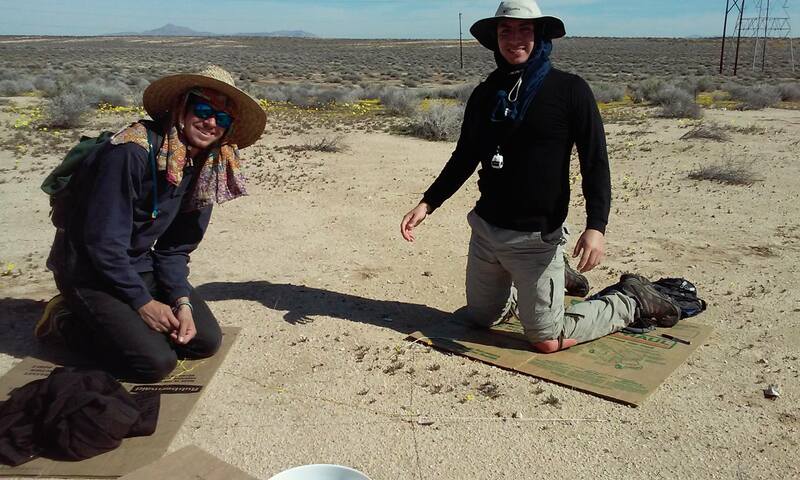 Join our Volunteer Crew in the Mojave Desert on Spring Break! 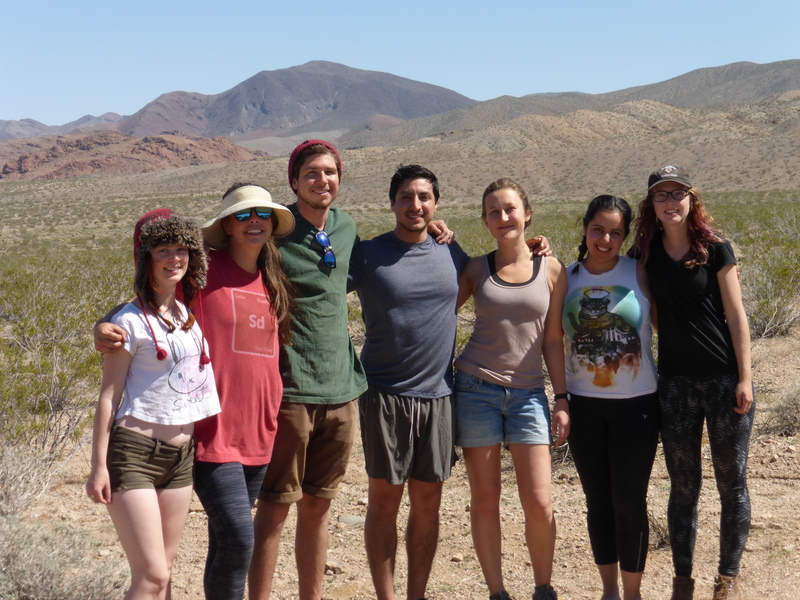 I take undergraduate students into the Mojave Desert to gather demographic data on desert annual species over the UCSC spring break . Participants gain valuable field experience in a really beautiful place, and when the winter rainfall is good we see a gorgeous desert bloom! See the Ecology of Renewable Energy page for more details on my ongoing Mojave research. I have two field sites, both of which are adjacent to BLM roads – one just outside Barstow, and the other near the intersection of highways 58 and 395 (Kramer Junction). We camp nearby and usually work for a few days at each site. The Barstow site is particularly lovely, in an area well known for its botanical richness. If we have time we can visit populations of two other rare plants in the vicinity. It is also likely that you will see the federally listed desert tortoise – I see them nearly every year on the spring break trip. Kit fox are also in the area. Read more about the trip and the work that we do! 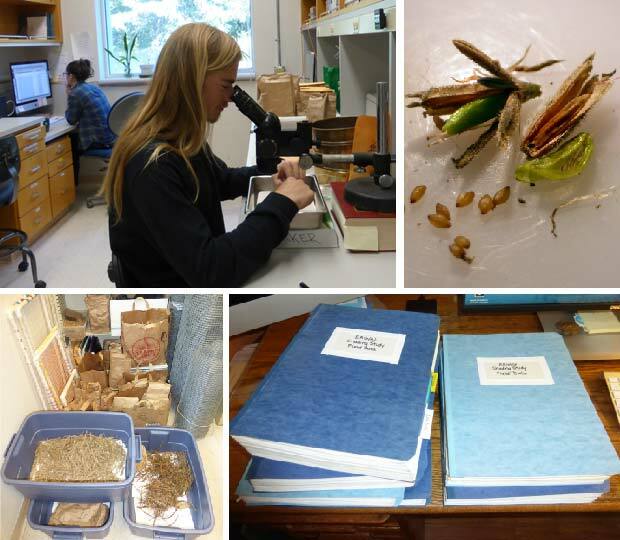 I always need volunteers and interns to help with greenhouse work, plant dissection, seed cleaning, seed counting, data entry, data proofing, and updating R scripts! Experience in a research lab is great for your resume, and provides insight into aspects of research that you may not be exposed to in an undergraduate classroom. No experience or specialized background knowledge is necessary – you will be trained for any task that I need your assistance on. Be sure to let me know if you have particular interests! I ask volunteers to donate a minimum of 2 – 5 hours per week, and scheduling is flexible once your initial training is complete. Snacks are provided! If you will be assisting in the lab, the University requires you to complete an online Laboratory Safety Training; you must also wear long pants and closed toe shoes. Once you have finished the training you will need to print out a certificate of completion, to be filed in laboratory records. If you have trouble registering for the online training, please contact Karen. Want to earn credit for work in the Parker Lab? Speak to me about enrolling for Exploring Research in EEB (BIOE 182F). This is a 2-unit course, which equates to a 6-hour commitment per week. You will work directly with me, and we will draw up a contract to use in assigning a grade at the end of the quarter based on your interests and lab needs – for example, if you want to learn how to use R (a statistical software package), I can provide training on this application. Timing of work in the lab is flexible to accommodate other course commitments. Interested in doing a senior thesis in the Parker Lab? I highly recommend you take Plant Ecology (BIOE 145 and 145L) as soon as possible – this upper division course and lab will prepare you to frame and address your own research questions! Ideally, you will complete this course before tackling the senior thesis course (BIOE 183W). See the Course Catalog for further descriptions of BIOE 145, BIOE 182, and BIOE 183. Copyright © 2019 Karen E. Tanner. Theme: Himalayas by ThemeGrill. Powered by WordPress.